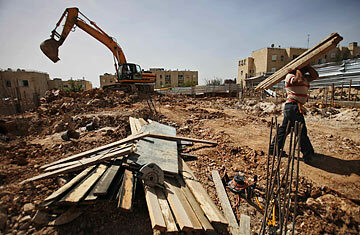 A Palestinian worker is seen on a construction site in the east Jerusalem neighborhood of Ramat Sholmo, Thursday, March 11, 2010. Most days, lobbyist Steve Aserkoff focuses on directly shaping the opinions of his assigned target audience  14 U.S. Senators and 65 members of the House. But on Sunday, the America Israel Public Affairs Committee (AIPAC) operative faced a different challenge: Preparing a conference room filled with several dozen grassroots Zionists, most of whom had never been to Capitol Hill before, to swarm the legislature in a mass lobbying effort. "We are going to the Hill to ask for three particular things," Aserkoff told the group, between PowerPoint slides listing talking points and showing maps of the Capitol complex. "The Capitol Police are not TSA, so do not disrobe when you enter those buildings." The amateur activists were preparing for Tuesday's blitz of Congress that has become a ritual of the annual policy conference of AIPAC, one of the nation's most influential interest groups. This year, according to Aserkoff, as many as 4,000 activists will hold roughly 500 meetings with their members of Congress or their staff. This year's AIPAC show of strength coincides with extremely sensitive moment in U.S.-Israel relations: Scarcely two weeks ago, the Israeli government embarrassed Vice President Joe Biden on a goodwill visit by announcing the construction of 1,600 more apartments for Israelis in East Jerusalem, occupied by Israel in 1967 but never internationally recognized as Israeli territory. The White House deemed the announcement a deeply negative signal of Israel's intent on the eve of a new round of indirect negotiations with the Palestinians that Washington has initiated. (The Palestinians claim East Jerusalem as their future capital.) The White House had, until Sunday, even held out the possibility that Obama would refuse to even meet with Prime Minister Benjamin Netanyahu during the Israeli leader's visit to Washington to address the AIPAC conference. After Israel reportedly offered new concessions in response to U.S. demands, a Netanyahu-Obama meeting is now scheduled for Tuesday. At the conference's opening session Sunday morning, Robert Satloff, director of the Washington Institute for Near East Policy, compared the current diplomatic crisis to the U.S.-Israeli standoff that followed the Israeli invasion of the Sinai Peninsula in 1956. "This isn't Suez," he said. "I would say it's more of a five or six on the Richter scale. It's not eight or nine." But, he added the events of the past two weeks would "leave scars at the highest levels," and perhaps "hasten Iranian efforts to achieve a nuclear weapons capability." Satloff's pivot from the peace process to the Iranian threat was made early and often by AIPAC conference speakers. Organizers made clear their belief that Iran's nuclear program, rather than the state of relations with the Palestinians, should top the agenda of U.S.-Israel relations. Sen. Evan Bayh, an Indiana Democrat, spoke for many when he said, "I do think [the settlements standoff] has been a distraction from the major issue at hand," which he named as the "ticking clock" of Iranian nuclear development. In his briefing, Aserkoff urged activists to focus their conversations with lawmakers on Iran, saying, "This remains our number one priority." Lobbying talking points distributed to conference delegates were pointed in their recommendations. "[T]he United States needs to lead the international community in imposing crippling sanctions on Iran without delay," they read, urging the adoption of new U.S. measures that would target foreign corporations involved in Iran's energy sector. Aserkoff was skeptical of President Obama's effort to get the U.N. Security Council to agree on meaningful new sanctions, noting that "The Chinese are never going to say, 'Yes, we want to sanction Iran.' "
The second lobbying priority identified for AIPAC delegates was to reaffirm the U.S.-Israeli relationship, and pressure the Obama Administration to avoid airing disagreements publically. Aserkoff referred to a letter arranged by AIPAC last year from several members of Congress to President Obama, urging the new White House to deal with Israel as a close friend. "I guess they didn't get that letter at the White House, because here we are again," he said. "It's kind of dumb to get into a big fight about some small issue." The talking points did acknowledge that the Netanyahu government had made "a mistake" in announcing the East Jerusalem construction during Biden's recent visit. "Despite this deeply regrettable incident," the document continued, "we are concerned with the public nature of the criticism and the demands placed on Israel by the administration. . . . [S]uch public condemnation will not serve to advance the peace process or efforts to prevent Iran from acquiring nuclear weapons capability." The conference highlight, during its Monday night banquet, will be an address by Netanyahu, along with Republican Senator Lindsey Graham of South Carolina and Democratic Senator Charles Schumer of New York. In his Sunday briefing, Aserkoff said he expects that dinner will be attended by about half of the legislators in the U.S. Senate and close to half of those in the House of Representatives. "We are all about relationships," Aserkoff told the room of lobbyists-in-training. "Because that is what works." Read "The U.S.-Israel Spat: Just a Sideshow."